iPhone has been a popular device to play movies and record videos with its big screen and high resolution. However, the complicated digital video formats make it troublesome to play videos on iPhone as well as share iPhone recordings. To eliminate confusions that unlucky iPhone users may have, below we will list the detailed iPhone compatible video formats, and how to deal with the incompatible formats. - Level-3 hardware acceleration delivers No.1 fast speed to convert videos for iPhone. * Motion JPEG (M-JPEG) up to 35 Mbps, 1280 by 720 pixels, 30 frames per second, audio in ulaw, PCM stereo audio in .avi file format. * H.264 QuickTime files in MOV format at 1080P 30fps is default recording format for iPhone. Slo-mo videos are recorded in 720p at 240fps or 1080P 120 fps. * High Efficiency Video Coding (HEVC) under the "High Efficiency" option for all iPhones running iOS 11 onwards. Sometimes we just have trouble to have iPhone videos played or shared because of iPhone's limited format library. When a video is not 100% compatible, you're likely to run into following situation. 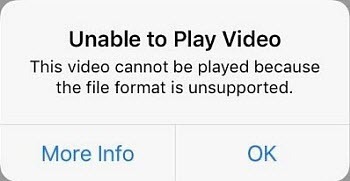 Some users report that it gives error message "Unsupported video format" even when they trying to play MOV videos or other compatible files on iPhone. Since the extension is listed as one of iPhone supported video formats, they are quite confused. Let's check why the problem occurs. MOV, MP4 and AVI are containers instead of codecs, which means that they may contain different codes except H.264, H.265, MPEG-4 or M-JPEG. That's why even when the extension is listed herein, iPhones still have trouble playing them. Some other video formats are only playable on the latest iPhones. For example, mobile HDR 10 and Dolby Vision formats are supported by iPhone 8/X and later only. Even HEVC is said to be played on all iDevices running on iOS 11 and later, it doesn't mean every resolution. Unfortunately, the older phones won't support 4K resolutions. And so far no iPhone models support 5k or higher. For example: iPhone 6, iPhone 6 Plus – max resolution of 1080p/240 fps; iPhone 5s – 1080p/60 fps or 720p/240 fps. When you import a higher resolution into iPhone, it will be downscaled to 2K and you may still suffer stuttering playback. In many cases the error "unsupported video format" on iPhone occurs when the import video is corrupted. 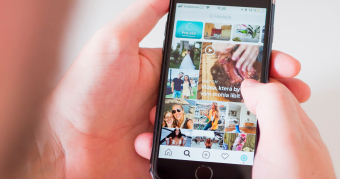 While iPhone is used as a popular device to store movies and videos offline for users to watch without internet, not all downloaded videos can be played on iPhone, however, especially those downloaded from untrusted sources. This is because the video file itself is broken or corrupted. In addition to online files, improper content transfer to iPhone or other app conflicts may also lead to corrupted files. Many other users have trouble to send or upload the videos recorded by iPhone XS/XR/X/8/7. This is mainly caused by two factors. 4K and HD videos, even in HEVC format, are quite big in size. On the contrary, most social media and email services have strict limits on the video size. For example, a minute of iPhone video at 4K 30fps takes up 300MB, while WhatsApp allows 16MB only. Then you will need to resize the iPhone video size. 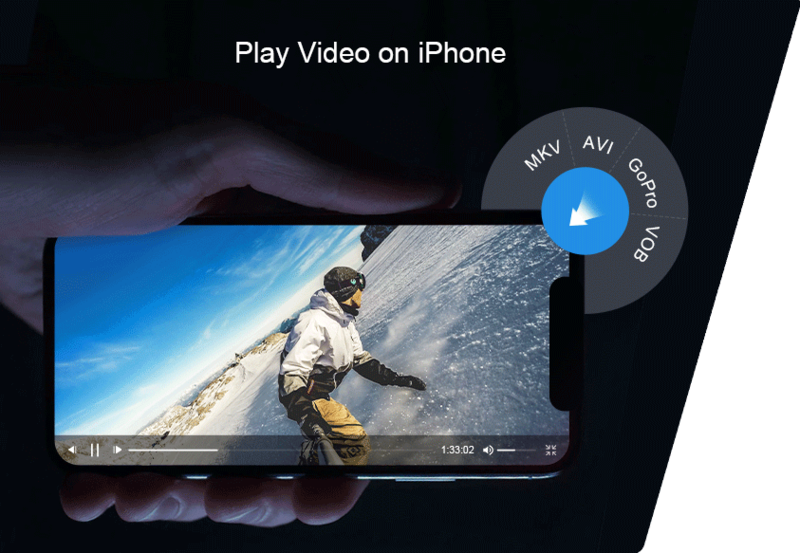 Adding HEVC as an iPhone recording video format is a welcome move as it saves half the size than H.264 while keeping the same video quality. However, the patent royalty requirements have limited the spread of HEVC. For example, HEVC is not a format for Instagram or WhatsApp. Also learn what to do when iPhone MOV videos refuse to play on Mac. VideoProc is a video processing tool dedicated to 4K and HD videos. It has a large format library of up to 420+ video formats with flexible settings to edit and adjust the videos. Its Level-3 hardware acceleration and high quality engine delivers the No.1 fast speed and high output quality. That's why it's selected as the best tool to convert videos into formats supported by iPhone, or process iPhone videos for easier sharing. Step 1. Import the video. Open VideoProc and you will see four options. Select "Video". Then click "+Video" to import the source video from computer hard drive. The software supports videos in any formats, including damages or corrupted files. Step 2. Select an output format. From the Target Format tab and select a format you need. 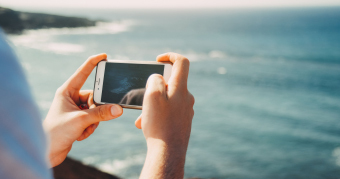 If you have trouble playing the video on your iPhone, select one of iPhone compatible video formats like H.264, or you can select the specific iPhone model from the presets profiles like iPhone XS, XS Max, XR, X/8 or earlier. If you need to convert iPhone camera format HEVC to upload easire, select the format you need. Step 3. Compress iPhone videos. Whether you want to save more storage on iPhone, or need to resize iPhone videos for social media, first click Option with a gear icon to adjust the video settings like bitrate and resolution. Then select Cut button to further edit the iPhone video for smaller size. Step 4. Hit "RUN" to convert iPhone videos and apply all the adjustments. Can't Play MOV on iPhone? Trouble is Solved! Videos Not Playing on iPhone? Check the Solution!